Glutamatergic neurons in the vlPAG produce antinociception A, Glutamatergic neurons were targeted by local vlPAG injection of AAV in transgenic mice that expressed Cre under control of the vesicular glutamate transporter 2 gene (vGlut2-cre). B, DREADDs expression in the vlPAG/dorsal raphe of vlgut2-cre mice (RNA-FISH). C, 83 ± 2% of green-labeled vGlut2+ transcripts in the vlPAG and dorsal raphe colocalized with mcherry-labeled neurons expressing vGlut2 RNA, and 95 ± 2% of mcherry-labeled vGlut2 cre-expressing neurons colocalized with green-labeled vGlut2+ transcripts. D, DREADDs are expressed in vlPAG/dorsal raphe vGlut2+ neurons as demonstrated by colocalized expression in the merged image. E, F, Bar graphs represent the median value of the data, while the error bars are the 95% CI. White bars indicate nociceptive testing before intraperitoneal CNO injections, while green bars indicate nociceptive testing 1 h after CNO administration. Pair-wise comparisons with a Wilcoxon signed-rank test indicated no significant behavioral difference in mCherry animals (n = 7) after CNO treatment. 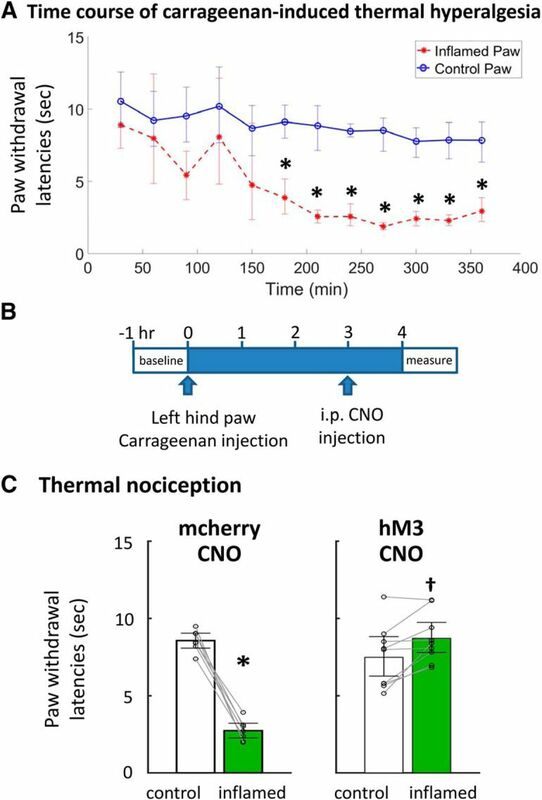 CNO activation of vlPAG glutamate neurons (hM3, n = 8) produced analgesia as indicated by increased paw withdrawal latencies to thermal (p = 0.0078) and mechanical stimuli (p = 0.0002) in vGlut2-cre mice, while inhibition (hM4, n = 8) caused increased sensitivity to both thermal (p = 0.0078) and mechanical stimuli (p = 0.0008). *p < 0.05. Dopaminergic neurons in the vlPAG produce antinociception. A, Dopaminergic neurons were targeted by local vlPAG injection DREADD containing AAV into transgenic mice expressing Cre under control of the DA transporter gene (DAT-cre). B, DREADDs expression in the vlPAG/dorsal raphe of DAT-cre mice (immunohistochemistry). 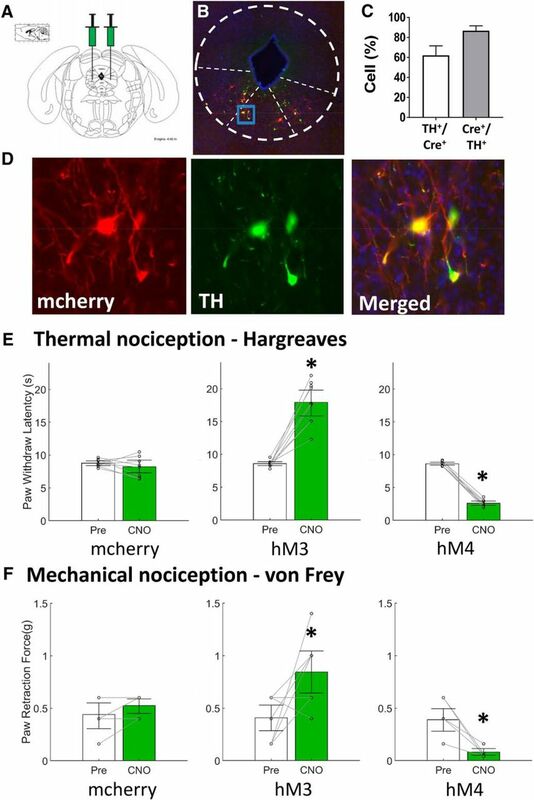 C, 61 ± 10% of green-labeled TH neurons in the vlPAG and dorsal raphe colocalized with mcherry-labeled neurons expressing DAT protein, and 84 ± 8% of mcherry-labeled DAT cre-expressing neurons colocalized with green-labeled TH containing neurons. D, DREADDs are expressed in vlPAG/dorsal raphe TH+ neurons as demonstrated by colocalized expression in the merged image. E, F, Bar graphs represent the median value of the data, while the error bars are the 95% CI. White bars indicate nociceptive testing before intraperitoneal CNO injections while green bars indicate nociceptive testing 1 h after CNO administration. Pair-wise comparisons with a Wilcoxon signed-rank test indicated no significant behavioral difference in mcherry animals (n = 8) after CNO treatment. 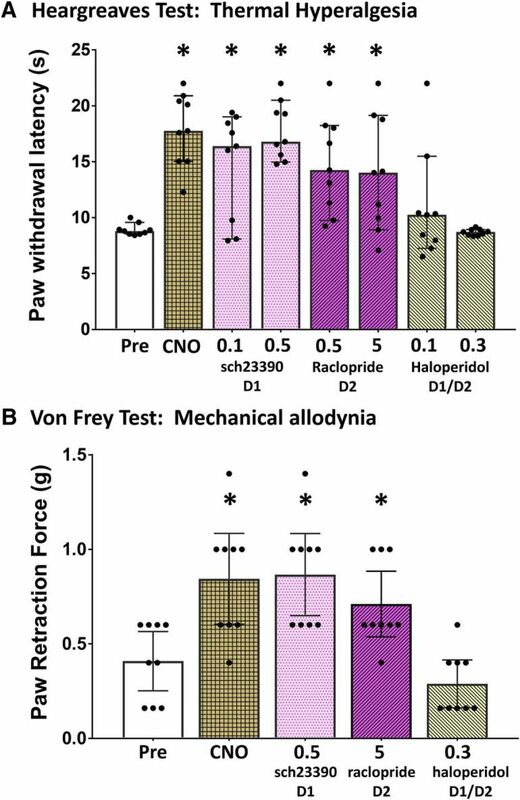 CNO activation of vlPAG DA neurons (hM3, n = 9) produced analgesia, with increased paw withdrawal latencies to both thermal (paired t test, df8, p < 0.0001) and mechanical stimuli (Wilcoxon signed rank, df8, p = 0.0313) in DAT-cre mice, while inhibition (hM4, n = 8) caused a significant decrease in paw withdrawal latencies to both thermal (paired t test, df7, p < 0.0001) and mechanical stimuli (Wilcoxon signed rank, df7, p = 0.0078). *p < 0.05. 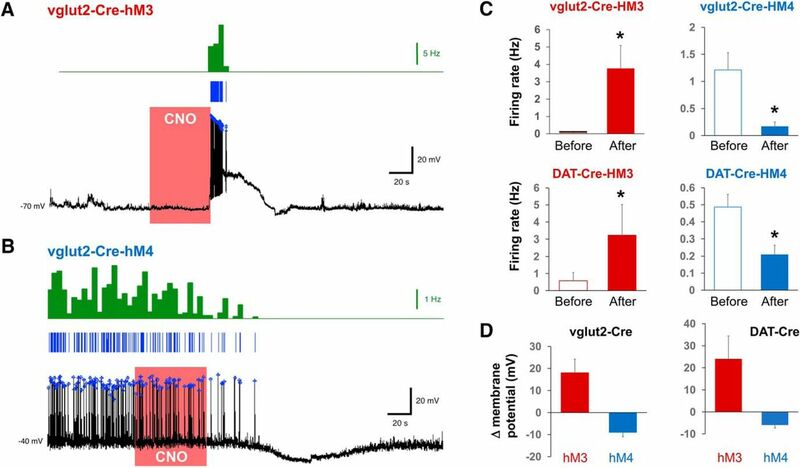 Functional characterization of hM3 and hM4 DREADDs in vlPAG/dorsal raphe neurons of vGglut2-Cre and DAT-cre mice. A, Whole-cell current-clamp recording from an hM3Dq-expressing vlPAG neuron. Brief bath application of 10 µM CNO (red box) caused a transient depolarization and robust action potential firing in both vGlut2 and DAT neurons. Blue lines represent individual spike events. These were then aggregated into 5-s bins and the frequency plotted as shown in the green histogram. B, Voltage trace showing that bath perfusion with 10 µM CNO caused prolonged membrane hyperpolarization and silencing of both vGlut and DAT vlPAG/dorsal raphe neurons. C, Quantification of the CNO effects on neuron firing rate in grouped vGlut2 and DAT neurons (n = 4). D, Quantification of the CNO effects on membrane potential (all values are mean ± SEM; *p < 0.05). 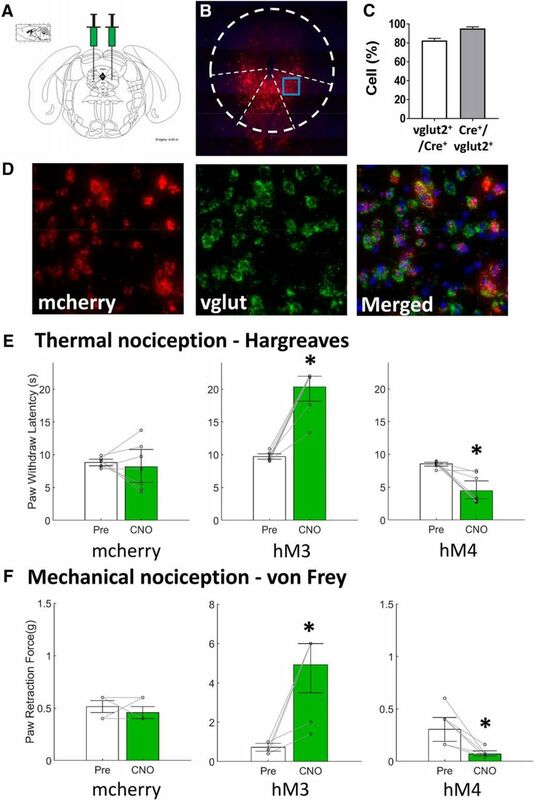 Glutamatergic neurons in the vlPAG drive fear responses, as assessed using open field and light/dark behavioral tests (mCherry = controls, hM3 = excitatory DREADD, hM4 = inhibitory DREADD). A, Open field test. DREADD activation (hM3, n = 8) of vlPAG glutamate neurons in vglut-2-cre mice produced decrease in distance traveled, velocity of travel, and time spent in the center of an open field along with increase in the time spent frozen when compared with control mice, while inhibition (hM4, n = 8) had no effect on these endpoints (ANOVA with Dunnett’s multiple comparison test, *p < 0.05, **p < 0.001). In contrast, DREADD activation (hM3, n = 8) or inhibition (hM4, n = 8) of dopaminergic vlPAG/dorsal raphe neurons in DAT-cre mice had no effect on distance traveled, travel velocity, center time, or freezing time (one-way ANOVA). B, In the light/dark test, DREADD activation (hM3, n = 8) of vlPAG/dorsal raphe glutamatergic neurons lead to decreased distance traveled, travel velocity, and time spent in the light side of the chamber as well as increased time spent in the dark, enclosed side of the chamber (Kruskal–Wallis with Dunn’s multiple comparison test, *p < 0.05, **p < 0.001). CNO inhibition of glutamatergic vlPAG/dorsal raphe neurons (hM4, n = 8) had no effect on these end points. 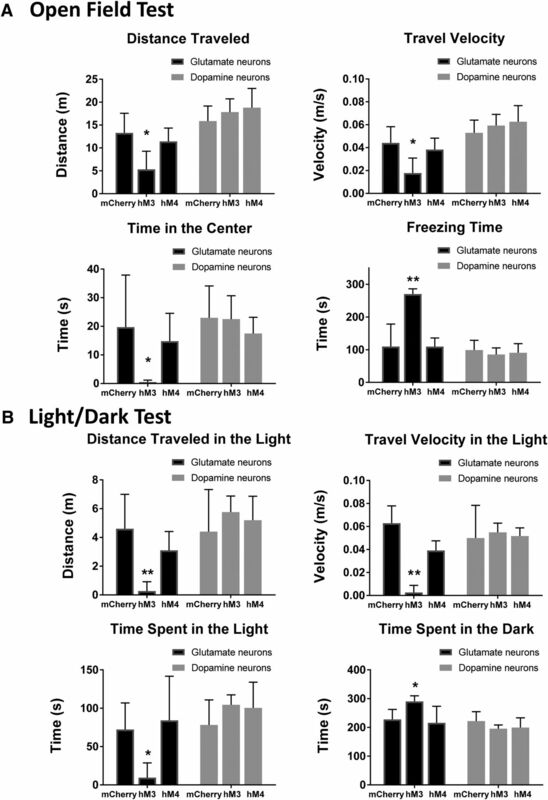 In contrast, DREADD activation or inhibition of dopaminergic vlPAG/dorsal raphe neurons (hM3, n = 8) also had no effect on distance traveled, travel velocity, or time spent on the light side of the enclosure nor on time spent in the dark, enclosed side (Kruskal–Wallis). Haloperidol inhibits vlPAG dopaminergic neuron mediated analgesia. A, B, Changes in paw withdrawal latencies to a thermal test were significant (one-way ANOVA, p < 0.0001) as were changes in paw retraction force (Kruskal–Wallis, p < 0.0001). Pair-wise comparisons indicated that only the nonspecific DA receptor antagonist haloperidol (0.3 mg/kg) prevented the analgesia induced by activation of vlPAG DA neurons by CNO (1 mg/kg), as paw withdrawal latencies (paired t test, p = 0.413) and retraction forces (Wilcoxon signed rank, p = 0.371) showed no significant change from baseline. In contrast, treatment with the selective D1 receptor antagonist SCH-23390 (0.5 mg/kg) or the selective D2 receptor antagonist raclopride (0.5 mg/kg) were ineffective in preventing the analgesia. *p < 0.05. Effect of vlPAG dopaminergic neuron activation on carrageenan-induced thermal sensitivity. A, A stable and significant reduction in paw withdrawal time to a thermal stimulus was achieved 180 min following carrageenan injection into the left hind paw of DAT-cre mice. B, Pre-carrageenan paw withdrawal latencies were measured to obtain a baseline. Three hours after carrageenan injection, experimental and control mice received intraperitoneal CNO injections. One hour later, paw withdrawal latencies were recorded for the inflamed and control paws. C, In mice expressing the hM3Dq DREADDs (hM3), CNO activation of vlPAG DA neurons produced an analgesic effect by significantly increasing the paw withdrawal latency of the carrageenan-inflamed paw (†, paired t test, df8, p = 0.0115). *p < 0.05. Thank you for sharing this eNeuro article. Message Body (Your Name) thought you would be interested in this article in eNeuro.